Watch the Sun come up from this perch high up in the Heart of Ottawa’s Urban Centre. The stunning circular wall of windows lets in light all day long and gives spectacular views over the Nation’s Capital, the Ottawa River and the Gatineau mountains. At 1454 square feet this unique layout offers two large bedrooms each attached to their own bath as well as a large den, suitable for home office, or guest room. 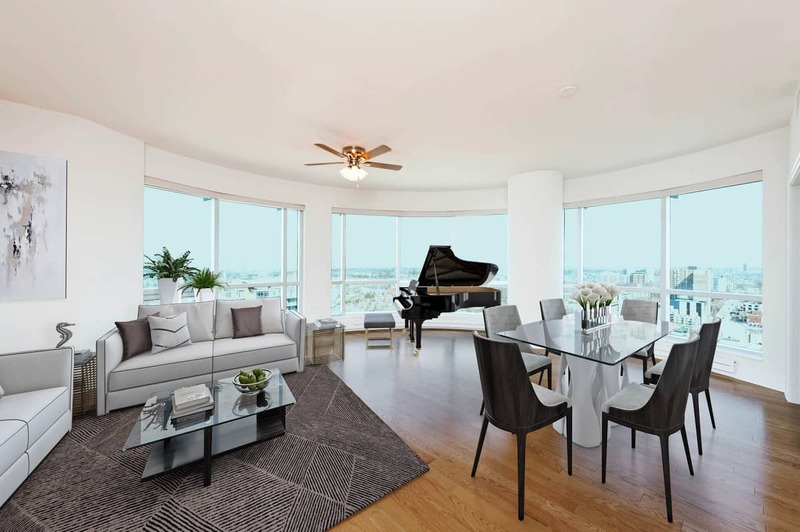 The huge open concept living space offers great flexibility to arrange your life as you see fit with lots of room to bring your Grand Piano. The spacious home-sized kitchen offers great counter and storage space in case you ever need it – don’t forget you can step out to hundreds of eateries of every nationality within just a few blocks! Click here to view the Photo Gallery or click the Play Button on the Youtube video below to get a glimpse. One of the few locations in Downtown Ottawa offering 24 hour security and Concierge service, you also have great amenities, two large terraces, indoor pool, sauna, gyms, theater, lounge etc! Location Location – the location is unbeatable for access to all that Ottawa’s urban lifestyle has to offer! Every type of food, entertainment, shopping, theatre, museums, galleries, as well as the new Light Rail Station is within a few blocks walk. Park your car underground, step out and enjoy! An easy walk to the famous Byward Market and Historic Rideau Canal. Work may also be a quick walk whether it be at Parliament or in the business district. With a fabulous walkscore of 98/100 it doesn’t get much better than this. Click on the link below to view the property details and floorplans. Also check out the walkscore info below. In an age where decent service is hard to find, Eric and his team offer professional, knowledgeable service that go above and beyond.